Need a sweet that won't add too much sugar to the waist and still delivers the building power of protein? This is a favorite family recipe that we have made for years, but the difference this time is that I used Swerve instead of honey. Swerve is a erythritol sweetener that is safe for many diets such as ketogenic, diabetics, and more. 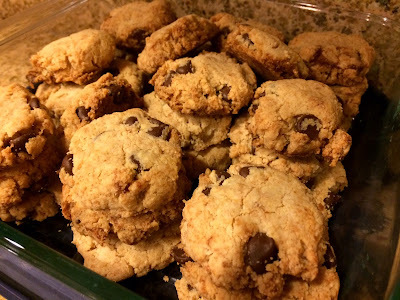 I did put regular dairy free chocolate chips in this batch, but if you leave those out, you have a very Keto safe cookie. Either way, it packs the protein and delivers great flavor so it is a perfect on the go granola bar alternative or breakfast treat with coffee. Enjoy! Mix ingredients and press into rounded teaspoons onto stoneware baking pan. Bake in preheated oven at 325 degrees for 12-17 minutes, or until cookies begin to turn golden (check them often so that they don't burn on the bottom). Stoneware works nicely to prevent cookies from burning on the bottom in the way that they tend to with glassware.